His breakfast cereal told him to sit on the roof. Greg went to play poker tonight and the boys and I are waiting for a pizza while watching Muppets From Space, which has to have the all time best soundtrack of any muppet movie ever. It's all 70s funk music which makes it a lot of fun. The best part of the whole thing, though is listening to Sam sing "Get up offa that thing" in his best James Brown imitation. Priceless. When I wrote the post below about an experience at Jack's football camp I hesitated to put it up because I was concerned some of you might wonder why I actually let him play football if I feel like he has to be "deprogrammed" afterward. So I'm feeling the need to qualify. For starters, I think you have to deprogram your kid from a lot of things, including school sometimes, so it's really not anything new to make sure your kid takes all the new information and points of view he discovers and assimilates it in a way that agrees with you. Secondly, we've been really happy with almost every aspect of the football program. It's a volunteer organization and, as is always the case, some volunteers are better than others. There's not much that can be done about the over-competitive parents and coaches that you will run across in your lifetime, except for learn to deal with them. Third, I don't think I can express to you how much Jack loves football. I don't understand it myself, but I've given up trying. It's been great for his fitness and his confidence.Jack's not an overly-expressive kind of guy, but the happiest I've ever seen him is when he's playing football. No amount of misguided pep talks could make me take that away from him. Lastly, this morning Jack had a lot of questions, so he, Greg and I had this really long conversation about plasma (the fourth stage of matter) and electricity and atoms and electrons and how you split atoms and what happens when you do. Well, Greg and Jack had a conversation and I mostly listened and wished I'd had more caffeine. It ended with Greg pulling out his college physics textbooks and then realizing they were no help because they're all based on calculus and me typing "quantum physics for kids" into the search box at Amazon.com. Honestly, I think it's good to have an outlet where the only thing you have to think about is knocking over the guy in front of you. Last week Jack attended a short football camp put on by our city's youth football team. They mostly ran drills and talked about football without helmets or gear or anything. We had wonderful cool spring weather, which I think is misleading to those folks who use the camp to see if their kids might be interested in playing in the fall. "Fall" is a misnomer because football officially starts this year on July 21 and it's two and a half hours a day for two weeks in hot and sticky weather that makes you feel like dying and you're not even the one wearing 15 pounds of gear. At the end of the last day of camp all the boys, about 100 ranging from age 5 to age 11, were called together in a huddle and the head coach said, "Y'all listen up now 'cause I'm gonna talk to you about football." He told them that because they play football, whether in a star position or warming the bench, they were "tough guys" because football is hard work. And as tough guys people look up to them because no one looks up to "those little sissy fellas." I about fell over because "sissy" really isn't a politically correct term, but I guess the football field is one of the last holdouts against political correctness. He went on to say that God used tough guys to do his work because "God didn't like those pansy guys." At this point there was some nervous laughter from the parents around me either because they're not used to mixing religion and football (in which case they should just get used to living in the South) or because the coach was taking some theological liberties or both. There's a good chance that in our town right now there are some boys worrying not only that they might be sissies, but that if they are God won't love them. The coach managed to finally make his point that, as tough guys, they are role models for their peers and they should spend their summer setting a positive example for others. He said that one way to set an example was to take up for kids who get picked on by bullies, which is sort of funny considering he'd basically just told them they were better than those "sissy fellas" and lots of them, including Jack, had just learned two new derogatory terms for what they would have previously only called "wimp." I hope this guy isn't Jack's coach in the fall. I'm not sure I have the strength for the amount of deprogramming that would be involved. Things I never saw at our school in California. I took this picture at the kids' school. 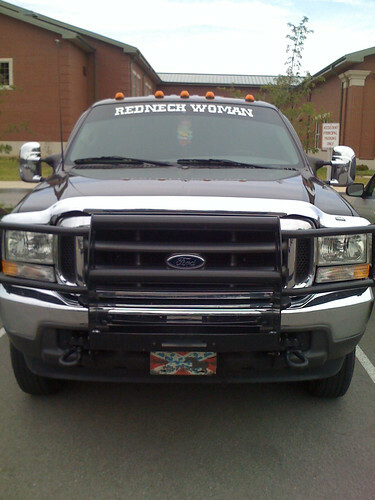 It's a big ol' dualie pickup truck with tow lights, a confederate flag license plate and "Redneck Woman" across the front windshield. Parked in the teacher's parking lot. I really, really want to know which teacher drives this thing to school every morning. Kindergarten? Music teacher? Librarian? Oh- school counselor! When I was in high school, my father strongly suggested to me that I should take a typing class. He learned to type during a time when boys weren't usually taught to type because they weren't going to be secretaries and he said it was a very handy skill to have. So I sat in the back row of the 6th period typing class and did my typing exercises asdf jkl; and eventually got the hang of it. Aside from reading, I'd say it's the most useful thing I ever learned in school. Okay, let's say it's tied with math for second place, but the need to type comes up way more often than a need to prove geometry theorems or to quote the prologue to the Canterbury Tales in middle-english. I don't have much opportunity to sing the preamble to the Constitution or to discuss themes from The Bridge of San Luis Ray but I type every day. My brother does not know how to type. Well, not properly, at least. He claims he never received the advice to take typing class. I guess that's possible, but perhaps he just wasn't paying attention or he never had a 6th period elective to kill. I don't know how he managed to get through a graduate program only hunting and pecking, but, he says, there's no point in learning to type now that it's over. He can be grateful now, though, that he never learnt. Because popping up all over the internet, I am now seeing people proclaiming that their number one pet peeve is this: People who put two spaces after the punctuation at the end of a sentence. I was vaguely aware that two spaces was a hold over from monofaced typeface where all the letters were the same size and therefore two spaces were needed for differentiation. However, I figured it didn't really matter that much, sort of the same way we use ' to mean feet and " to mean inches when actually those are quotation marks and not the correct marks for feet and inches at all. I can't remember what the correct marks are called, but they slant toward the right and are way more complicated to reproduce on your computer. Having learned to type on an old IBM Selectric, I double space at the end of my sentences. Actually, since I was vaguely aware that it wasn't necessary, I tend to go both ways. If I end up editing or pasting a sentence, it probably will have one space at the end. If I typed it and never looked back, it probably will have two. Apparently, my double spacing after a sentence is annoying to the grammar sticklers out there who have given up trying to make people use apostrophes correctly. I've laughed lots of times at "CD's" and "cherrie's" for sale, but now that I'm on the receiving end, the grammar nazis are not so funny. The only reasons given for not using two spaces are "It's not necessary." and "It's slightly harder to read." Eh. I'm a little annoyed at the derogatory way the extra space is viewed. It's a bad habit- one worth breaking. It's "obnoxious." It's "spacing trash." I think there should be a little more compassion and understanding. Why don't they just let us old typewriter taught typists do our own thing and call it "generational?" Teach new typists the new way and eventually the "arcane" way will die off. Right? Just stay off my case and let me do what I want with my own space bar. No matter how many bananas I buy, I always end up with two going bad. Well, they get enough brown spots on them so that no one will pick them up and eat them and then it's a quick slide downhill from there. I've tested it in a very un-scientific manner. If I buy 3lbs of bananas at Costco- two go bad. If I buy 6 (fairly green) bananas from the grocery store- two go bad. Part of what's annoying about this is that two bananas isn't really enough for banana bread. So I freeze them. Now I have 37 (that's an estimate) ziploc bags full of two bananas each waiting for me to get all excited about making banana bread, which will happen eventually, I'm sure. Right after I make blueberry muffins with the frozen blueberries from last July.